Color blindness is basically a deficiency of color vision, the most common of which is the Red-green color vision defect. People with this defect have difficulty in differentiating between red and green color hues. It is a X-linked genetic disorder as both genes for red and green receptors are located in the X chromosome. As you probably already know, males have only one X chromosome while females have two X chromosomes. 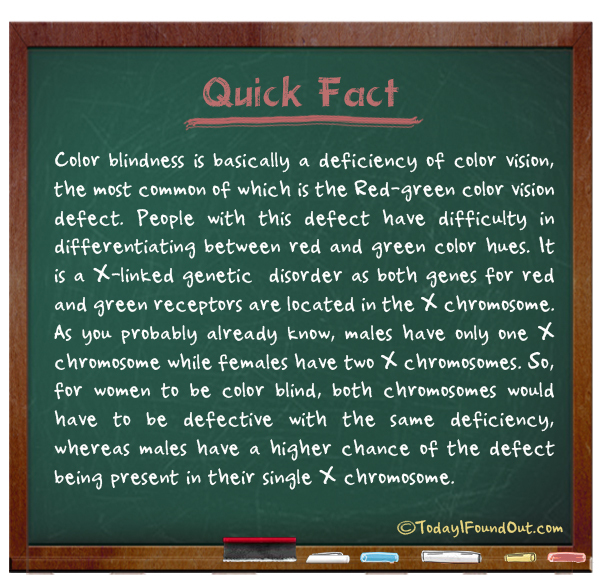 So, for women to be color blind, both chromosomes would have to be defective with the same deficiency, whereas males have a higher chance of the defect being present in their single X chromosome.